How awesome is this Monster Popcorn Candy Mix? This is a super cute and creepy idea from In Katrina’s Kitchen. 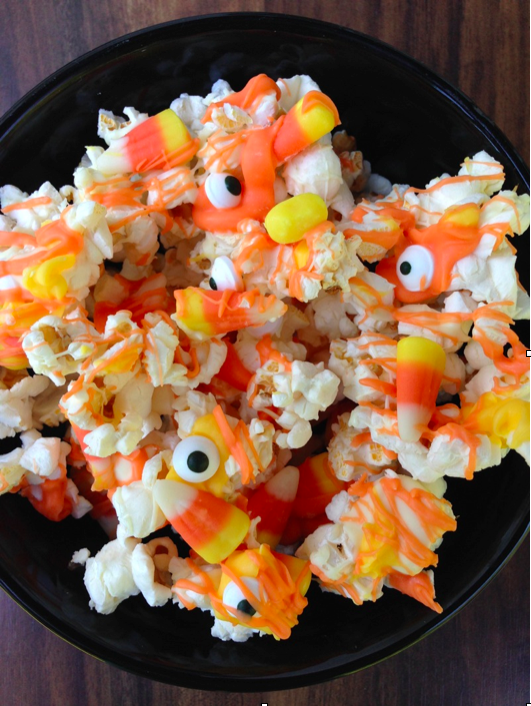 All you need is some popped corn, colored chocolate for drizzling, candy corn and candy eyes. The original recipe includes Reese’s Puffs cereal, but I’m sure they are optional. You might also find it easier to first spread the popcorn on the cookie sheet, drizzle the chocolate and then place the candies where you want them. Whatever works best for you. If you mix the candy into the popcorn first, the candies sink to the bottom and you’ll also end up covering the candies in chocolate, making them harder to see. And of course we want to see them.